I’ve long since shown my students these photos but I’ve been horrible this school year with keeping up with my own personal blogging site. Maybe it’s the cold weather that makes me turn to nature. Maybe I just want to show off these pictures. Maybe I’m just a bit crazy and okay with sharing some of that craziness. Whatever the case, I devote my first of this new batch of blogs to Skychi, Gronda, Buente, Oka, Cincy, Gwtine, and Bwit! Seven inhabitants welcomed themselves around my home this past late spring and early summer. Most folks would not take so kindly to these guests and my neighbors really hoped I evicted them stat. I, on the other hand, err on the patient side of life so these creatures stayed with me for their needed nesting duration before moving on to greener pastures. Long story short, these seven black and white furballs invaded uninvitedly but exited peacefully. My niece uniquely named them: Skychi (Mama Skunk) and her children Gronda, Buente, Oka, Cincy, Gwntine, and Bwit (she wanted to be sure I spelled them correctly here). 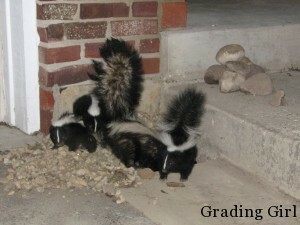 Apparently, Mama Skunk and her babies felt completely safe around my home during their residency because they did not spray once. They were quite quiet, actually. I refused to cage them . . . not only is that inhumane, that would guarantee a stubbornly stinky spray session. Rather, I waited for the six darling babies to grow and leave the burrow they called home under my home. 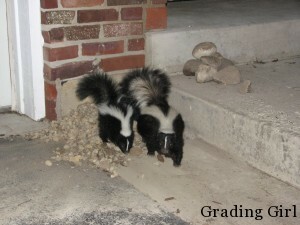 Skunks are naturally docile and only spray when they feel threatened. They have MAD digging skills!!! They are not disturbed by noise during the day. 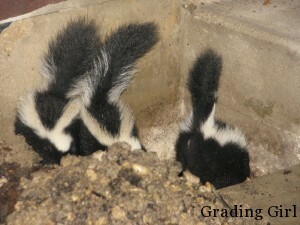 On some days, I’d have friends sitting next to the hole, talking but neither hide nor hair from the skunks. They were used to certain voices, I think! The little ones don’t seem to realize their spray capabilities until they leave the nest. 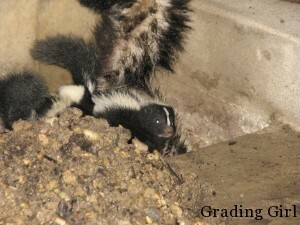 Mama Skunk keeps them nested until three months old – she arrived late April, had her babies, and left with her clan in late July. 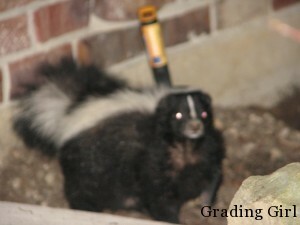 Skunks hate cayenne paper and onions! 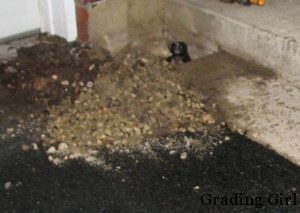 Today, all holes have been professionally inspected and re-sealed very carefully with cement; I don’t think I’ll be graced with a repeat visit nor do I want to take a chance. (I think I just got lucky with an extremely docile group). My neighbors now talk amusingly about my summer hosting! No one was sprayed so everyone’s content . . . and amused!! One big happy, sweet family! Cute faces that I couldnt cage. I just held my breath that theyd hold the spray!! Startling sight, but no spray . . . to my delight!